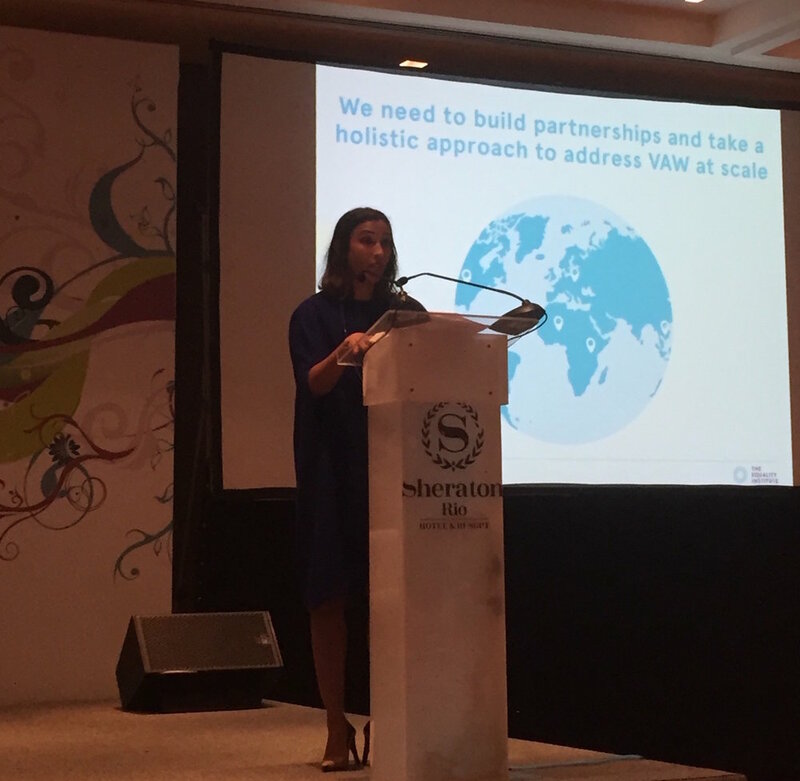 In her remarks during the Opening Plenary at the Sexual Violence Research Initiative Forum 2017, our Director, Dr Emma Fulu, presented how she sees the current state of the violence research field, including the challenges and opportunities that lie ahead. Dr Emma Fulu presenting at the Sexual Violence Research Initiative Forum 2017 Opening Plenary. The violence against women research field has achieved so much and there is a lot to be proud of: violence against women and girls (VAWG) is on the global development agenda in a way it never has been before; there is more funding and more national and global policies on VAWG; and we have multiple targets addressing VAWG in the Sustainable Development Goals (SDGs) that governments are obliged to report on. The SDGs illustrate that sustainable development can’t be achieved without addressing VAWG, and that addressing VAWG will contribute to achieving multiple development outcomes. This requires building bridges across unlikely sectors, integrating work on VAWG into large scale development strategies around climate change, education, and poverty reduction. The challenge, however, is that a recent influx of money into prevention programming has attracted new actors to the field, including large, global consulting firms, and some international non-governmental organisations with limited or no experience in gender or violence-related programming. Funding is being channelled towards these agencies and technical institutions and there has been a systematic withdrawal of financial support for women’s organisations and for the political organising and social mobilisation they do. As a result there is now a serious danger that violence prevention and response work is becoming depoliticised and losing its feminist roots. This is problematic as preventing violence is fundamentally dependent on transforming unequal power relations and structures, which is a feminist agenda. While everyone has a role to play and as we build partnerships, we need to strike a careful balance between technical approaches and making sure that feminist and women-centred analysis and methods underpin all efforts to address VAWG. This is not just about our external agenda. We must also work towards maintaining progressive, feminist, and self-reflective practices internally, as individuals and as organisations. The how matters as much as the what. As a research field we have moved from understanding the scale of the problem, its causes and consequences, to trying to understand what works to prevent and respond to violence. Thanks to the hard work of so many in the violence prevention field and the increased investment in building an evidence base, we now know more about what’s working and what’s not than ever before. And there is relative consensus around guiding principles for VAWG prevention. However, we seem to have fallen into a trap of valuing one type of evidence or knowledge over others. We have valued academic knowledge over local, practice-based learning and experience. Quantitative over qualitative. Numbers over stories. Research over practice. Knowledge from the Global North over the Global South. This limits our learning, and ultimately the effectiveness of our work. To continue to advance the field we need to embrace diverse forms of knowledge and evidence. We need to recognise that there are multiple ways to produce rigorous evidence. To do that we need to build meaningful and equal partnerships between researchers, practitioners, activists and donors, and really challenge the current myth that there is only one type of rigorous evidence. As a field, we have proven that VAWG is preventable and that violence can be reduced in relatively short periods of time: in years not generations. This is a huge achievement. A number of well-publicised intervention programmes have really captured people’s imaginations, such as SASA!, Stepping Stones, Intervention with Micro-finance for AIDS and gender equity (IMAGE), and others. The challenge here is that the evidence isn’t reaching practitioners on the ground. There is also now a focus on replicating these ‘proven’ models which is stifling innovation and locally-grounded work. This is reinforced by pressure coming from the needs of different stakeholders: policy makers are under pressure to produce immediate results; donors are under pressure to invest in things that ‘work’; and researchers are under pressure to prove what works. But we must remember that this is a new field. We have some ideas about what works, but we don’t necessarily know why they work, or how they create change. We need to continue to create space for experimentation and innovation. If we are open to failure in the short-term we will be more successful in the long-term. VAWG is a global problem of epidemic proportions. Unfortunately we have not yet seen a meaningful decrease in prevalence rates of violence. We have established small-scale solutions, but the next big question remains around how we address and respond to violence on a large scale. Our response must be multifaceted, systematic and long-term. One challenge is that we have focused on a deficit model: we centre our energy on the problem. We also talk about ending violence, instead of promoting peace. If believe that what we focus on expands, we need to take a more positive and hopeful perspective and lift up all the positive, creative, ground-breaking examples of transformation that we see at individual and community levels. That’s why the Sexual Violence Research Initiative is so important. Here partnerships are absolutely vital. We cannot reach genuine scale with our efforts unless we break out of competitive silos. Scale-up is not just about expanding the reach of individual programs, but is fundamentally about building a movement. A global movement that recognises that the multiple forms of oppression that people face are interconnected, and if we address them together we are much more likely to be successful. A movement that recognises that we all have similar goals. After all, we are more alike than we are different. Sexual Violence Research Initiative Forum 2017 Opening Plenary panel: Claudia Garcia-Moreno, Dr Emma Fulu, Marcos Nascimento, Jacqueline Pitanguy, Colleen Varcoe, and Brisa De Angulo.